Tiria the ottermaid is happy living in Redwall Abbey with her friends and family but she cannot help hankering for adventure. Highly skilled in the use of the sling, Tiria would love to go roving the way many of her otter kin do but her father won't hear of it. Then, quite suddenly everything changes. One night Martin the Warrior speaks to Tiria in her dreams and she learns that she is destined to be more than just a Redwall ottermaid - she is destined to be a queen, a queen who will lead her people out of slavery. Meanwhile on Green Isle, many miles away, the evil wildcat warlord Riggu Felis, is trying to subdue a small group of otters who seek to free their island of the wildcat and his servants. Many otters have been enslaved by the cats, and the otter leader, a brave renegade called Leatho Shellhound, is determined that the reign of the cats must end. More than anything he wishes that Queen Rhulain, a famous otter leader who lived many years ago, could come to the island to free his people and yet he dare not hope that such a hero exists in the present day. This gripping and moving tale of heroism, sacrifice, and the fight for freedom will delight both Redwall fans of longstanding and newcomers to the series. 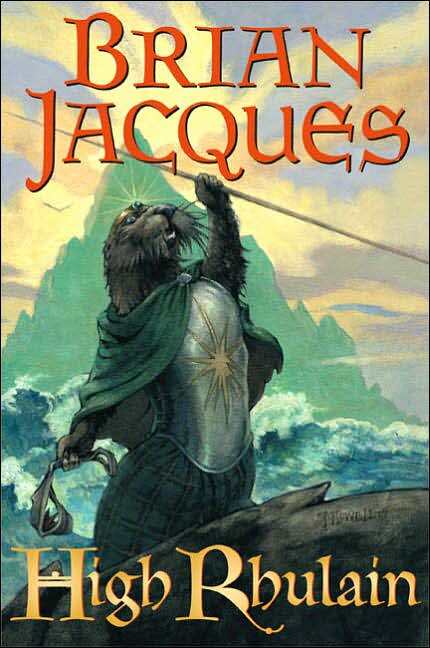 Brian Jacques paints a vivid portrait in words of a young otter who strikes out into a world she knows little about. Determined to do what she can to help those in need, she leaves the only home she has ever known to fulfil her destiny. Peopled with funny and brave hares, bright and determined otters, moles, mice, a strong badger lord, and a good number of vermin creatures, this is a tale rich with humor, warmth, wonderful mouth-watering meals, song, and lots of riddles to solve.